Nova Scotia (IPA: /ˌnəʊvəˈskəʊʃə/) (Latin for New Scotland; Scottish Gaelic: Alba Nuadh; French: Nouvelle-Écosse) is a Canadian province located on Canada's southeastern coast. Its capital, Halifax, is a major economic center of the region. It is the fourth least populous province of Canada, though second most densely populated. It is the most populous province in Atlantic Canada. Nova Scotia is the second smallest province in Canada, after Prince Edward Island, with an area of 55,284 square kilometers (21,345 sq mi). The province includes several regions of the Mi'kmaq nation of Mi'kma'ki, which once covered all of the Maritimes, as well as parts of Maine, Labrador, Newfoundland, and the Gaspé Peninsula. Nova Scotia was home to the Mi'kmaq people when the first European explorers arrived in the eleventh century. French colonists established Port Royal, Nova Scotia in 1604, founding what would become known as Acadia, as the first permanent European settlement north of Florida. The British Empire obtained control of the region between 1713 and 1760, and established a new capital at Halifax in 1749. In 1867 Nova Scotia was one of the founding provinces of the Canadian Confederation, along with New Brunswick, and the Province of Canada (which became the separate provinces of Quebec and Ontario). Nova Scotia's economy is traditionally largely resource-based, but its industries have diversified since the middle of the twentieth century. Fishing, mining, forestry and agriculture remain very important and have been joined by tourism, technology, film, music, and finance. Nova Scotia is a province located in eastern Canada fronting the Atlantic Ocean to the south and east, the Gulf of Saint Lawrence to the north, and the Bay of Fundy to the west. 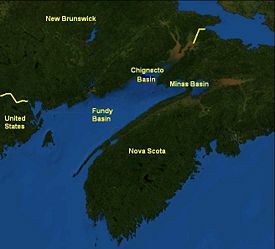 Its only land boundary is with New Brunswick which is connected via the narrow Chignecto Isthmus to the west. It is one of the Maritime Provinces, along with New Brunswick and Prince Edward Island. 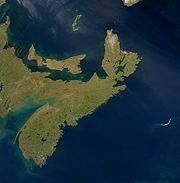 The province's mainland is the Nova Scotia peninsula surrounded by the Atlantic Ocean, including numerous bays and estuaries. There is no location within Nova Scotia that is more than 67 km (40 mi) from a body of water. 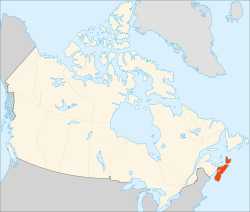 Cape Breton Island, a large island to the northeast of the Nova Scotia mainland, is also part of the province, as is Sable Island, a small island notorious for its shipwrecks, approximately 175 km (109 mi) from the province's southern coast. Despite its relatively small size, its geography is complex, due to more than 3,000 lakes and hundreds of short rivers and streams that flow through landscapes variously mountainous, hilly and forested. Cape Breton Island's lake Bras d’Or is saline, connected to the Atlantic Ocean through three short channels. 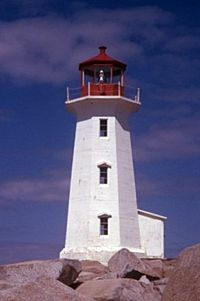 Nova Scotia is Canada's second smallest province in area after Prince Edward Island. It does not stretch as far north as any other province, making it Canada's most southern province even though it does not have the most southern location in Canada. Both Ontario and Quebec stretch farther south than does Nova Scotia. Nova Scotia lies in the mid temperate zone and, although the province is almost completely surrounded by water, the climate is closer to continental rather than maritime. The temperature extremes of the continental climate are moderated by the ocean. Rainfall varies from 140 centimeters (55 in) in the south to 100 centimeters (40 in) elsewhere. It is very foggy in places, with Halifax averaging 196 foggy days per year and Yarmouth 191. The modifying influence of the sea. Because Nova Scotia juts into the Atlantic, it is prone to tropical storms and hurricanes in the summer and autumn. There have been 33 such storms, including 12 hurricanes, since records were kept in 1871—about once every four years. Paleo-Indians camped at locations in present-day Nova Scotia approximately 11,000 years ago. Archaic Indians are believed to have been present in the area between 1000 and 5000 years ago. Mi'kmaq, the First Nations of the province and region, are their direct descendants. While there is some debate over where he landed, it is most widely believed that the English explorer John Cabot visited present-day Cape Breton in 1497. The first European settlement in Nova Scotia was established in 1604. The French, led by Pierre Dugua, Sieur de Monts established the first capital for the colony Acadia at Port Royal in 1604 at the head of the Annapolis Basin. In 1620, the Plymouth Council for New England, under King James I of England designated the whole shorelines of Acadia and the Mid-Atlantic colonies south to the Chesapeake Bay as "New England." The first documented Scottish settlement in the Americas was of Nova Scotia in 1621. On September 29, 1621, the charter for the foundation of a colony was granted by James VI to William Alexander, 1st Earl of Stirling and, in 1622, the first settlers left Scotland. This settlement initially failed due to difficulties in obtaining a sufficient number of skilled emigrants and in 1624, James VI created a new order of Baronets; admission to this order was obtained by sending 6 laborers or artisans, sufficiently armed, dressed & supplied for two years, to Nova Scotia, or by paying 3000 merks to William Alexander. For six months, no one took up this offer until James compelled one to make the first move. In 1627, there was a wider uptake of baronetcies, and thus more settlers available to go to Nova Scotia. However, in 1627, war broke out between England and France and the French re-established a settlement at Port Royal which they had originally settled. Later that year, a combined Scottish and English force destroyed the French settlement, forcing them out. In 1629, the first Scottish settlement at Port Royal was inhabited. The colony's charter, in law, made Nova Scotia (defined as all land between Newfoundland and New England) a part of Scotland, this was later used to get around the English navigation acts. However, this did not last long: in 1631, under King Charles I, the Treaty of Suza was signed which returned Nova Scotia to the French. The Scots were forced by Charles to abandon their mission before their colony had been properly established and the French assumed control of the Mi'kmaq and other First Nations territory. In 1654, King Louis XIV of France appointed aristocrat Nicholas Denys as Governor of Acadia and granted him the confiscated lands and the right to all its minerals. English colonists captured Acadia in the course of King William's War, but England returned the territory to France in the Treaty of Ryswick at the war's end. The territory was recaptured by forces loyal to Britain during the course of Queen Anne's War, and its conquest confirmed by the Treaty of Utrecht of 1713. France retained possession of Île St Jean (Prince Edward Island) and Île Royale (Cape Breton Island), on which it established a fortress at Louisbourg to guard the sea approaches to Quebec. This fortress was captured by American colonial forces then returned by the British to France, then ceded again after the French and Indian War of 1755. From 1691 to 1696, what is now Nova Scotia was included as part of the territory of the Province of Massachusetts Bay. Thus mainland Nova Scotia became a British colony in 1713, although Samuel Vetch had had a precarious hold on the territory as governor from the fall of Acadian Port-Royal (Annapolis Royal) in October 1710. British governing officials became increasingly concerned over the unwillingness of the French-speaking, Roman Catholic Acadians, who were the majority of colonists, to pledge allegiance to the British Crown, then George II. The colony remained mostly Acadian despite the establishment of Halifax as the province's capital, and the settlement of a large number of foreign Protestants (some French and Swiss but mostly German) at Lunenburg in 1753. In 1755, the British forcibly expelled the over 12,000 Acadians in what became known as the Grand Dérangement, or Great Expulsion. The colony's jurisdiction changed during this time. Nova Scotia was granted a supreme court in 1754 with the appointment of Jonathan Belcher and a Legislative Assembly in 1758. In 1763 Cape Breton Island became part of Nova Scotia. 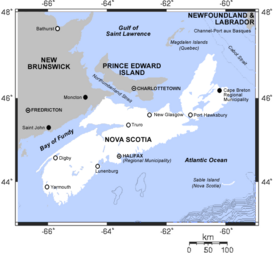 In 1769, St. John's Island (now Prince Edward Island) became a separate colony. The county of Sunbury was created in 1765, and included all of the territory of current day New Brunswick and eastern Maine as far as the Penobscot River. In 1784 the western, mainland portion of the colony was separated and became the province of New Brunswick, and the territory in Maine entered the control of the newly independent U.S. state of Massachusetts. Cape Breton became a separate colony in 1784 only to be returned to Nova Scotia in 1820. 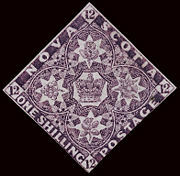 During the colonial period, Nova Scotia issued its own postage stamps printed in England. This distinctive diamond shape (issued between 1851 and 1857) was also used by neighboring New Brunswick. Ancestors of more than half of present-day Nova Scotians arrived in the period following the Acadian Expulsion. Between 1759 and 1768, about 8,000 New England Planters responded to Governor Charles Lawrence's request for settlers from the New England colonies. Several years later, approximately 30,000 United Empire Loyalists (American Tories) settled in Nova Scotia (when it comprised present-day Maritime Canada) following the defeat of the British in the American Revolutionary War. Of these 30,000, 14,000 went to New Brunswick and 16,000 to Nova Scotia. Approximately 3,000 of this group were Black Loyalists (slaves of African ancestry), about a third of whom soon relocated themselves to Sierra Leone in 1792 via the Committee for the Relief of the Black Poor, becoming the Original settlers of Freetown. Large numbers of Gaelic-speaking Highland Scots migrated to Cape Breton and the western portion of the mainland during the late 18th century and 19th century. About a thousand Ulster Scots settled in the 1760s, largely through the efforts of colonizer Alexander McNutt. Just over a thousand farming migrants from Yorkshire and Northumberland settled central areas of Nova Scotia between 1772 and 1775. Nova Scotia emerged as a major shipbuilding power beginning in the 1840s. Large numbers of wooden sailing ships were built and by the 1860s, the colony owned a substantial share of the shipping of the British Empire. At first building ships to sell to British shipowners, the province moved in the 1850s to building and operating its own fleet of merchant ships around the world. Nova Scotian vessels became a common sight in every major port. Some such as the barque Stag were famous for speed, but Nova Scotian vessels were most noted as efficient and versatile cargo carriers. One Nova Scotian shipowner, Samuel Cunard went on to found the giant Cunard Line steamship company in 1840, but most of the province's shipowners stayed with sail. The shipping industry peaked in the 1870s with the construction of the ship William D. Lawrence, the largest sailing ship ever built in Canada. Nova Scotia was the first colony in British North America and in the British Empire to achieve responsible government in January-February 1848 and become self-governing through the efforts of Joseph Howe. Pro-Confederate premier Charles Tupper led Nova Scotia into the Canadian Confederation in 1867, along with New Brunswick and the Province of Canada. "…the scheme [confederation with Canada] by them assented to would, if adopted, deprive the people [of Nova Scotia] of the inestimable privilege of self-government, and of their rights, liberty, and independence, rob them of their revenue, take from them the regulation of trade and taxation, expose them to arbitrary taxation by a legislature over which they have no control, and in which they would possess but a nominal and entirely ineffective representation; deprive them of their invaluable fisheries, railroads, and other property, and reduce this hitherto free, happy, and self-governed province to a degraded condition of a servile dependency of Canada." A motion passed by the Nova Scotia House of Assembly in 1868 refusing to recognize the legitimacy of Confederation has never been rescinded. Repeal, as anti-confederation became known, would rear its head again in the 1880s, and transform into the Maritime Rights Movement in the 1920s. Some Nova Scotia flags flew at half mast on Canada Day as late as that time. The government of Nova Scotia is a parliamentary democracy. Its unicameral legislature, the Nova Scotia House of Assembly, consists of fifty-two members. As Canada's head of state, Queen Elizabeth II is the head of Nova Scotia's Executive Council, which serves as the Cabinet of the provincial government. Her Majesty's duties in Nova Scotia are carried out by her representative, the Lieutenant-Governor. Halifax is home to the House of Assembly and Lieutenant-Governor. Nova Scotia's politics are divided on regional lines in such a way that it has become difficult to elect a majority government. Rural mainland Nova Scotia has largely been aligned behind the Progressive Conservative Party, Halifax Regional Municipality has overwhelmingly supported the New Democrats, with Cape Breton voting for Liberals with a few Progressive Conservatives and New Democrats. This has resulted in a three-way split of votes on a province-wide basis for each party and difficulty in any party gaining a majority. In 1996 the incorporated cities within the province were amalgamated into Regional Municipalities. Halifax, the provincial capital, is now part of the Halifax Regional Municipality, as is Dartmouth, formerly the province's second largest city. The former city of Sydney is now part of the Cape Breton Regional Municipality. Nova Scotia's traditionally resource-based economy began diversifying in the latter decades of the twentieth century. The rise of Nova Scotia as a viable jurisdiction in North America was driven by the ready availability of natural resources, especially the fish stocks off the Scotian shelf. The fishery was a pillar of the economy since its development as part of the economy of New France in the 17th century. However, the fishery suffered a sharp decline due to overfishing in the late twentieth century. The collapse of the cod stocks and the closure of this sector resulted in a loss of approximately 20,000 jobs in 1992. Due, in part, to a strong small business sector, Nova Scotia now has one of the fastest growing economies in Canada. Small business makes up 92.2 percent of the provincial economy. Mining, especially of gypsum, salt and barite, is also a significant sector. Since 1991, offshore oil and gas has become an increasingly important part of the economy. Agriculture remains an important sector in the province. In the central part of Nova Scotia, lumber and paper industries are responsible for many of the employment opportunities. Nova Scotia’s defense and aerospace sector generates approximately $500 million in revenues and contributes about $1.5 billion to the provincial economy annually. Nova Scotia has the 4th largest film industry in Canada hosting over 100 productions yearly, more than half of which are the products of international film and television producers. The Nova Scotia tourism industry includes more than 6,500 direct businesses, supporting nearly 40,000 jobs. Two hundred thousand cruise ship passengers from around the world flow through the Port of Halifax each year. Halifax ranks among the top five most cost-effective places to do business when compared to large international centers in North America, Europe and Asia-Pacific. A satellite photo of Nova Scotia. The Minister of Education is responsible for the administration and delivery of education, as defined by the Education Acts of 1995-1996, and other acts relating to colleges, universities and private schools. The powers of the Minister and the Department of Education are defined by the Ministerial regulations and constrained by the Governor-In-Council regulations. Nova Scotia has more than 450 public schools. The public system offers primary to Grade 12. There are also some private schools in the province. Public education is administered by seven regional school boards, responsible primarily for English instruction and French immersion, and also province-wide by the Conseil Scolaire Acadien Provincial, which administer French instruction to students for whom the primary language is French. The Nova Scotia Community College system has 13 campuses throughout the province. The community college, with its focus on training and education, was established in 1988 by amalgamating the province's former vocational schools. The province has 12 universities and colleges, including Dalhousie University, University of King's College, Saint Mary's University (Halifax), Mount Saint Vincent University, Nova Scotia College of Art and Design, Acadia University, Université Sainte-Anne, Saint Francis Xavier University, Nova Scotia Agricultural College, Cape Breton University, and the Atlantic School of Theology. According to the 2001 Canadian census, Nova Scotia's population was 897,565. 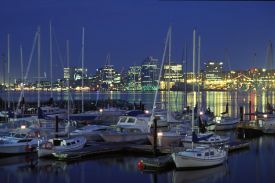 Its largest urban area is that surrounding the capital city of Halifax. The largest was Scottish (29.3 percent), followed by English (28.1 percent), Irish (19.9 percent), French (16.7 percent), German (10.0 percent), Dutch (3.9 percent), First Nations (3.2 percent), Welsh (1.4 percent), Italian (1.3 percent), and Acadian (1.2 percent). Nearly half of all respondents (47.4 percent) identified their ethnicity as "Canadian." The most commonly spoken language was English, followed by French. The largest religious denominations by number of adherents according to the 2001 census were the Roman Catholic Church with 327,940 (37 percent); the United Church of Canada with 142,520 (16 percent); and the Anglican Church of Canada with 120,315 (13 percent). Nova Scotia's music and culture is influenced by several well established cultural groups that are sometimes referred to as the "founding cultures." 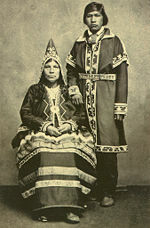 Originally populated by the Mi'kmaq First Nation, the first European settlers were the French, followed by Scottish, English, Irish,and Africans, all of whom contributed to the cultural mix. The Irish Famine of the nineteenth century and, more significantly, the Scottish Highland Clearances resulted in large influxes of migrants with Celtic cultural roots. This helped to define the dominantly Celtic character of Cape Breton and the north mainland of the province. The Gaelic influence continues to play an important role in defining the cultural life of the province as evidenced by the number of Nova Scotians today who are fluent in Scottish Gaelic. Nearly all live in Antigonish County or on Cape Breton Island. The provincial government works to support Mi'kmaq, French, Gaelic and African-Nova Scotian culture through the establishment of government secretariats, as well as colleges, educational programs and cultural centers. The Province is also eager to attract new immigrants, but has had limited success. The major population centers at Halifax and Sydney are the most cosmopolitan, hosting large Arab populations (in the former) and Eastern European populations (in the latter). Nova Scotia has long been a center for artistic and cultural excellence. Halifax has emerged as the leading cultural center in the Atlantic region. The city hosts such institutions such as NSCAD University, one of Canada's leading art, craft and design colleges, and the Symphony Nova Scotia, the only full orchestra performing in Atlantic Canada. The province is home to avant-garde visual art and traditional crafting, writing and publishing, and a film industry. Nova Scotia is arguably best known for its music. While popular music from many genres has experienced almost two decades of explosive growth and success in Nova Scotia, the province remains best known for its folk and traditional based music. Its traditional (or folk) music is Scottish in character, and traditions from Scotland are kept true to form, in some cases more so than in Scotland. This is especially true of the island of Cape Breton, one of the major international centers for Celtic music. In main land Nova Scotia, particularly in some of the rural villages throughout Guysborough County, Irish influenced styles of music are commonly played, due to the predominance of Irish culture in many of the county's villages. ↑ Population and dwelling counts, for Canada, provinces and territories, 2011 and 2006 censuses. Statistics Canada (January 24, 2012). Retrieved April 3, 2012. ↑ Gross domestic product, expenditure-based, by province and territory. Statistics Canada (November 8, 2010). Retrieved June 19, 2012. ↑ Derek Croxton. The Cabot Dilemma: John Cabot's 1497 Voyage & the Limits of Historiography University of Virginia - Corcoran Department of History. Retrieved November 14, 2008. ↑ 4.0 4.1 S. Carter. 2007-2008. Migrationnews Canada. Oceania Development Group. Retrieved November 14, 2008. ↑ Nova Scotia Business Inc. Defence, Security & Aerospace.Retrieved November 14, 2008. ↑ Nova Scotia Film Development Corporation. Production Statistics for the 12 Month Period Ended March 31, 2008. Retrieved November 14, 2008. ↑ Government of Nova Scotia. Going Global, Staying Local-A Partnership Strategy for Export Development. Retrieved November 14, 2008. ↑ 8.0 8.1 Statistics Canada. Population by selected ethnic origins, by province and territory (2001 Census) (Nova Scotia) Retrieved November 14, 2008. ↑ Statistics Canada. Selected Religions, for Canada, Provinces and Territories - 20% Sample Data Retrieved November 14, 2008. ↑ Nova Scotia Office of Gaelic Affairs. Gaelic in Nova Scotia Retrieved November 14, 2008. Desserud, D. A. 1999. "An Outpost's Response: The Language and Politics of Moderation in Eighteenth-Century Nova Scotia." AMERICAN REVIEW OF CANADIAN STUDIES 29: 379-406. Mancke, Elizabeth. 2005. The fault lines of empire: political differentiation in Massachusetts and Nova Scotia, ca. 1760-1830. New World in the Atlantic world. New York, NY: Routledge. ISBN 0415950007 Online version. Retrieved May 9, 2008. Whitelaw, William Menzies. 1934. The Maritimes and Canada before Confederation. Toronto: Oxford University Press. Online version. Retrieved May 9, 2008. This page was last modified on 13 December 2018, at 20:50.